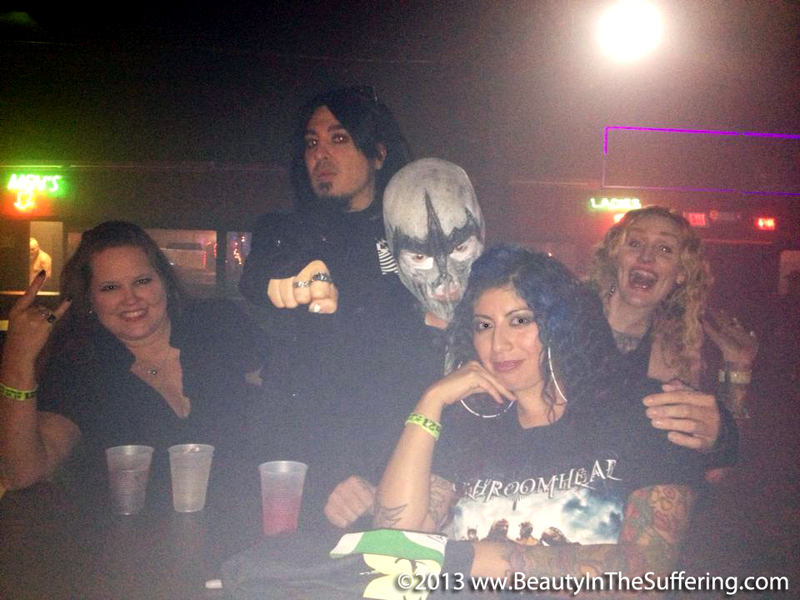 DieTrich Thrall with Rich Juzwick of GEMIINI SYNDROME and Provo Provenzano of SKINLAB @ The Chameleon Room in OKC for the Mushroomhead show on 02.14.13. 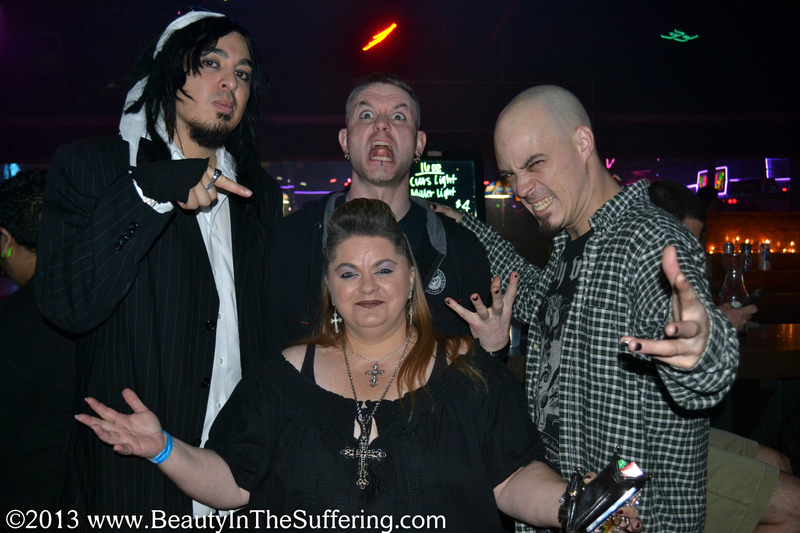 Another shot of DIETRICH THRALL at the Chameleon Room in Oklahoma City on 02.14.13 with RICH JUZWICK of GEMIINI SYNDROME and PROVO PROVENZANO of SKINLAB. 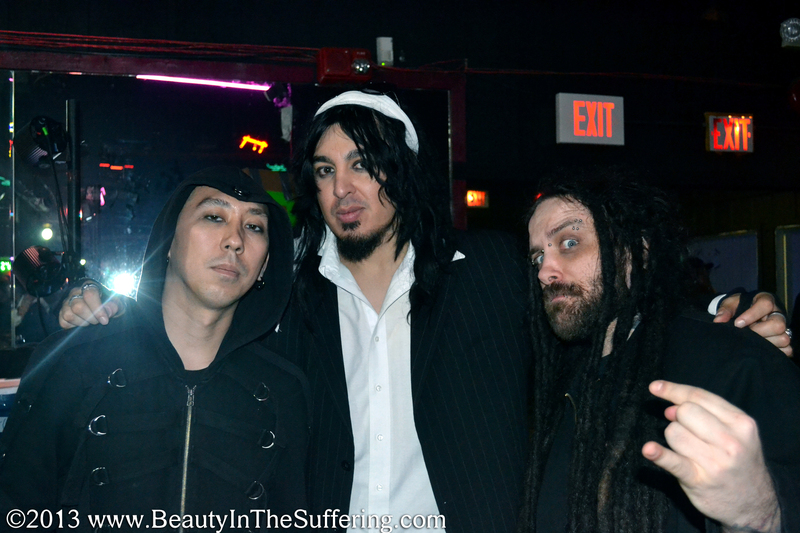 DieTrich Thrall with Rick Thomas and Waylon Reavis of MUSHROOMHEAD @ The Chameleon Room in OKC for the Mushroomhead show on 02.14.13. 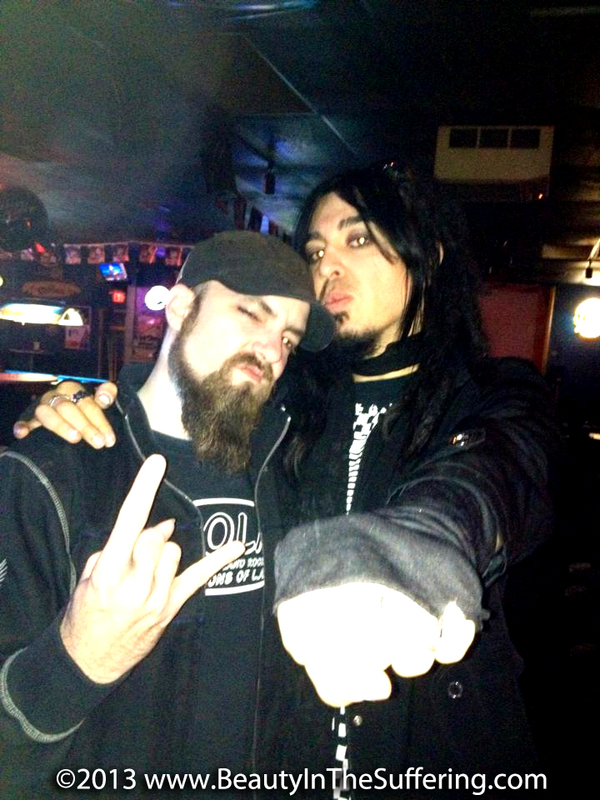 Took a quick break from the studio to hang out at the Chameleon Room in Oklahoma City on 02.14.13 where our friends in Mushroomhead and Gemini Syndrome were performing. More pictures to be posted in the coming days. March 1st we are laying guitars, bass, and vocals @ Pirated Sound Studios – stay tuned! “BEAUTY IN THE SUFFERING is an evolving concept I came up with years ago that best described a sense of optimism during some bright spots of an otherwise massive struggle against overwhelming odds. Everybody has moments where the road looks impossible to pass. But somehow, little by little we manage through our own inner strength and the purposeful placement of fate, chance, and karma. We emerge wiser and with a deeper understanding of ourselves and of our place in the world and the beauty we glean from the suffering we have endured can never be denied. DieTrich (pronounced Dee-Trick) is best known for his co-founding and co-visionary role in the industrial-metal band MARAZENE (later called MARAZENE MACHINE). From managing the band during its most active and successful National touring years (2006-2008) with acts such as MUSHROOMHEAD, WEDNESDAY 13, DEADSTAR ASSEMBLY and PSYCLON NINE, to co-producing the bands critically hailed cover of MOTLEY CRUE‘s “LIVE WIRE” in 2011 as well as the bands lone official full length album (MachiNation, 2006), to writing fan favorite tracks such as “GIVE” (SkumF***erz), to guiding the bands philisophical and edgy lyrical approach (AnTiThesis, Infidel Society), to producing multiple videos for the band, DieTrich’s contributions and influence are heavily noted.